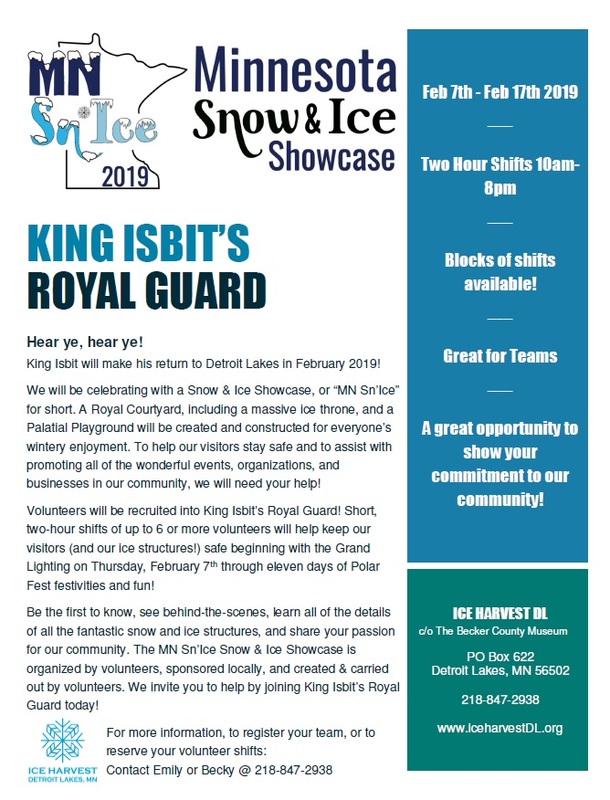 Ice Harvest DL activities are “by the community, for the community” and we couldn’t do it without you! Ice Harvest DL is a non-profit organization. The 2018 Ice Palace, the 2019 & 2020 Ice Structures and Snow & Ice Showcase, and the 2021 Ice Palace are all fully funded through sponsorships and donations. Click here to view our sponsors and for more information on how you can sponsor or donate! Ice Harvest DL steering committee members are volunteers. We want to spotlight the ingenuity and tenacity of our community by offering unique winter activities you can’t find anywhere else! But we need your help to get it done. Sign up for Royal Guard Duty!